So, Yesterday I installed owfs and got first read. I made a little script that read sensor every 15 minutes and wrote it to file. 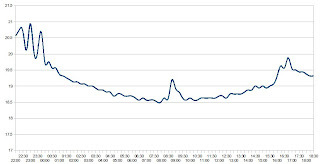 Here is my living-room temperature from 22:00 30.09.2009 to 18:30 01.10.2009. I took out my old laptop, about 5-6 year old with 1,2GHz and 256MB RAM. Useless for everyday use, perfect for server type use. Currently it has some kind of Windows installed, but I found live CD with owfs. ISO file is less then 50MB and I have to say that it worked quite well, but I will probably find something better to install.